You've got to love the complaint of the customer in this video about the echo on the satellite circuit. "Do I get charged extra for bouncing off this satellite?" In that era the noise, echo and clipping was expected at times in that stage of technology. Someone hearing that today would think he had a justifiable complaint but in the 60s and 70s the tension between the customer and the operator was the customer's expectation of good quality voice (too many televised space missions) and every day reality . The frustration of the operators of that time was explaining to customer's that "this is it, this is the connection you have and this is the rate" in a patient and calm way and start timing as quickly as possible. ...performing that work was a unique juxtaposition of using old technology that had been adapted over decades, to access and utilize new technology that hadn't been fully developed yet. It required skill to manage an old cord switchboard whose basic design was from 1929, updated with electromechanical switching advances and mark sense computer technology...an analog world...and somehow get satellite to work well enough that a customer could have at least a modicum of "exclusivity of conversation." They "could hear" and "be heard," although more often than not, with effort. The quality of this video is rough, likely due to conversion from analog to digital and with compression. It gives a pretty good idea of what it was like handling calls in the AT&T International Operating Centers in the late 60's and early 70's. This appears to be in the Manhattan IOC where the cordboards were much older and built out from the original "Overseas Operator" centers. 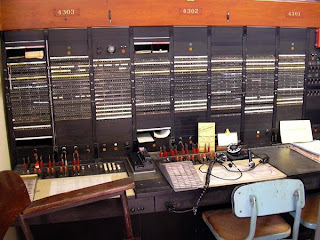 Manhattan and Oakland at one time had the higher call volumes due to having access to the majority of unique dedicated circuits. The other IOCs were located in Montreal, White Plains, Pittsburgh, Springfield, Denver and Jacksonville. Springfield, Denver and Jacksonvlle were new centers built to handle the volume by placing operators where there were new Number 4 ESS Toll switches being placed. The majority of the call volume was handling calls that could be key pulsed by the operator using the International Dialing Codes on a North American tandem trunk. There were additional reasons for locatons, for example MARISAT began communcations service in 1976 and Jacksonville was atmospherically deal to handle High Seas on the Atlantic Ocean. In the Jacksonville IOC the cordboards were actually fairly new, reconditioned standard Western Electric cord switchboards pulled out of a Toll Center that was closed somewhere. They were installed in the early 70s in four units of the IOC and the beautiful wood paneling was painted over with colors of that era (different color for each unit) with murals on the walls. It would look very dated now although the idea was to make the building as modern and forward looking as possible in the most cost effective way. The Springfield, Jacksonville and Denver centers had been built to meet the rapidly growing demand for international calling. Their primary function was to process calls on North American tandem trunks (for example the new 4 ESS Toll Switch in Jacksonville) that would soon be handled by IDDD (International Direct Distance Dialing). The operators were processing volumes of calls by in effect dialing IDDD for the customers on station-to-station calls since the IDDD had not been rolled out on even a small scale in addition to the person, collect, card, coin, hotel and third-party billed calls. The original design was to then convert these centers to International Service Position Systems (ISPS) in these more remote and lower wage cost centers. No one correctly predicted the demise of the Bell System, Divestiture and later the internet...making these centers functionally moot. This is an interesting video "seizing a trunk in USA for posterity" using Skype in the great tradition of phone phreaking "back in the day." If you know the history behind these two formerly Independent telcos and how they became what they are today (including a new formula-ized name for one of them), this is interesting news. "It also marks another step in the consolidation of America's traditional phone operators. Such companies are under consistent threat from wireless and cable-television operators. That has made efficiency all the more important for CenturyTel and Embarq, which run phone operations in 25 states and 18 states, respectively." "The deal will involve Embarq shareholders receiving 1.37 shares of Centurytel stock for each share of Embarq stock they own, resulting in a combined entity in which Embarq shareholders "are expected to own approximately 66 percent and CenturyTel shareholders are expected to own approximately 34 percent," a press release said. The deal price represents 36 percent value of Embarq's Friday closing stock price. Glen F. Post III, CenturyTel's Chairman and Chief Executive Officer, said in the press release that joining the two companies will accelerate the strategic plans of both. Telco consolidation at the independent level has been expected for many months, though the credit crisis and macro-economics conditions were seen as freezing progress toward such deals." "CenturyTel's bid to acquire Embarq is surprising on at least a few levels."... "This is an intriguing deal, and more details--as well as more questions--are sure to emerge in the days ahead. " Yes indeed...the industry landscape and the names change but the direction remains largely the same. Rick Wehmhoefer was the first male to be hired as a genuine AT&T operator after a class action suit was settled. In reality there were those of us hired prior to that, mostly high school and college students working as part-time operators, when the job was still openly considered a "woman's job." 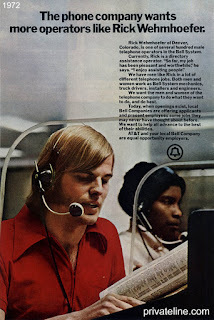 Our purpose was to help AT&T prove they did hire "non-traditional" operators and it was understood that it was only meant as a entry job for a guy until he was moved up into a "man's job." It was a different era, unless you lived in that time, it's difficult to understand how the accepted attitudes were then. Judith Beeman's version of the official story that she wrote from interviewing Rick is on www.privateline.com. This is an interesting video on the history of operators, at first teenage boys but soon replaced by women. "Use of Women as Telephone Operators: Early History"
"This is a panic in the way of the fine 19th-century panics, where we all run around like headless chickens." R. JEREMY GRANTHAM, chairman of a Boston investment firm.